The episode begins with Ralph and Sherlock staking out Cicada. They take pictures and bring them back to Star Labs. They explain his background to the Team. They show a picture of his “daughter/niece” and explain why he hates meta's (from her going into a coma during the Enlightenment). They explain that Dwyer has visited Gracie every day and every night for the past 3 weeks. Barry suggests going to get him right away. Sherlock says there's no way unless they have a power dampener. Nora comes up with the idea to make one. One that’s more powerful than Cicada’s dagger. A supercharged magnet. The team is doubtful that they could make it happen, but Nora suggests they go into the past: all things from Barry’s past arch enemies. Barry is worried it will mess with the timeline but Nora says it won’t, due to the fact that they are all discarded objects in time. She then suggests a time hack, where they plant something in the past (the weapon to defeat Cicada) to have it prepared for the future. Sherlock seems suspicious of her plan. Barry doesn’t want Nora to travel with him. Nora says she wants to fix what she screwed up, but Barry refuses. Iris is disappointed, thinking that Nora should go with him because it was her solution. Cisco comes up with the dates Barry has to return to. When they defeated Savitar and blew up his suit. The night Zoom injected the speed force into himself. The night of the particle accelerator for dark matter. Then they plan to plant what they build inside the hospital. The Team goes to tell Barry, while Sherlock stays behind to show Cisco Nora’s journal. She has a code in it that is identical to the one Barry was writing when he came out of the speed force. Sherlock is cautious but Cisco wants to trust Nora. Barry agrees to the plan and tells Nora she can tag along. Barry warns Nora never to go off book and to do exactly as he says. Barry pulls them out of the speed force at the exact night Savitar was defeated. They watch Savitar and Past!Barry have an epic showdown. Barry tells Nora he has to get the shard. She grabs it as she watches Iris kill Savitar. The two rush out of that time period before the shard disappears from existence. Barry pulls them out for their next step. They are in 2016 with Zoom when Barry is about to lose his speed. Barry goes looking for what he needs, but he can’t find it anywhere. Nora follows Iris and sees her talking to Past!Barry, giving him the strength to push forward. Barry is still frantically looking for the object, but he gets caught by Wells from Earth 2. Wells doesn’t realize it’s Future!Barry. He is destroyed by what is happening and almost breaks what Nora and Barry came for. Barry stops him at the last moment and grabs it, but then Zoom shows up, catching both of them before they’re able to get back into the speed force! Zoom realizes that Nora is another speedster, and they try and get away from him as fast as they can. They get into the speed force just in time but end up in a mysterious time period with Zooms weapon broken. Nora suggests they go back to get Thawne’s help but Barry refuses until he realizes they are already in the day where Barry already once traveled back to get Thawne’s advice. They go to Thawne and he immediately realizes by Barry’s protectiveness that Nora is his daughter. Barry asks Thawne to fix the object from Zoom for him. Thawne wants to know what for, but Barry doesn’t want to tell him, yet Nora cracks and spills it’s for destroying Cicada’s dagger. Thawne starts working on Zooms weapon and Nora continues to explain what their plan is with Cicada. Thawne says their plan is a well thought out, and Barry admits it was Nora’s idea. Something seems to register with Thawne. He fixes what they need and speeds away. Nora starts to tell Barry something, but Barry interrupts her and tells her they need to go. Barry speeds off, but Nora hesitates, giving a long stare at Thawne, before speeding off behind him. Barry and Nora finally go back to where it all began, the night of the partial accelerator. Barry tells Nora that they shouldn’t use their speed, because Thawne will feel it. The listen in as “Wells” gets ready to blow up the city. “Wells” hears something and begins to follow Barry and Nora, and they run away. He’s about to discover them when Cisco interrupts and distracts him. Cisco and “Wells” have a conversation about how proud Wells is of him, while Barry and Nora listen in. Barry begins to reposition the dark matter in the way they need, while Nora wanders and almost touches Thawne’s suit, ruining the timeline. Nora asks why Barry hates Thawne so much, and Barry has to explain that he killed his mother, hoping that the tragedy would keep him from becoming The Flash. Nora explains that she didn’t know that and realizes it’s why Barry didn’t want her to come alone. He didn’t want her to know all the awful things he’s gone through. But Nora insists that she wants the truth, and she just wants to know her father. The recalibration completes, and history repeats itself. There is a flashback of all the people who were affected by the accelerator. When they get their dark matter, Barry and Nora go to the hospital and plant what they need in the walls for the future, before speeding off. They get back to the present and Barry proclaims it’s time to go and get Cicada. Cicada is at the hospital with Barry and the Team is hiding out waiting for the right time to approach him. 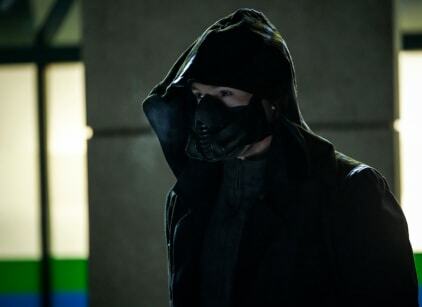 Barry shows up at the hospital and waits outside for Cicada, challenging him. Cicada meets him, and Barry explains that not all meta’s are responsible for Grace. He lets Cicada know that he knows about pain and death too. Cicada reveals that after he kills every meta, he plans to kill himself as well. He also reveals he knows that Vibe, XS and Elongated Man are all waiting for him in the shadows. They manage to miss his dagger (as was their plans all along) and it hits right where they planted the dark matter. The plan works, and Cisco breeches the dagger away. Surprisingly, Cicada recalls the dagger back from space and hits them all with a power dampening wave. He goes for Flash, but Caitlin turns into Killer Frost and knocks him over with a freeze blast. Caitlin is ready to square off, but when he sees her, he flees. The Team tries to locate Cicada but they can’t trace him. They realize that Frost is immune to Cicada’s dagger since she didn’t come from dark matter and she may be the key to saving everyone. Nora approaches Sherlock looking for her journal. He shows her the code and confronts her about it. Nora claims that she uses that code, which is something she created, as a way to remember things about her father no matter what happens. Sherlock claims she is clever but still seems suspicious as she leaves. He goes to the computer and translates what she’s written, which says “the timeline is malleable.” She then travels to the past to watch Barry’s parents before they died. Barry follows her but tells her it’s okay. Nora asks Barry if he ever thinks about stopping what’s about to happen and he tells her every day. Nora goes and uploads her journal, sending the code to Thawne. She then goes to deliver him a message herself. She finds him and tells him that they need to talk.